Several years ago a man and his wife were invited to spend the weekend at the home of the husband’s employer, who was very wealthy. The employer was quite generous as a host and treated the couple to the finest restaurants and took them on expensive day trips. As the three of them were about to enter an exclusive restaurant one evening, the boss stopped suddenly and looked at the pavement for one long, silent moment. The wife could see there was nothing on the ground except a dirty penny. Still silent, the employer reached down and picked up the penny. He held it up, smiled, then put it in his pocket as if he’d found a great treasure. What need did this rich man have for a single penny? Why would he even take the time to stop and pick it up? 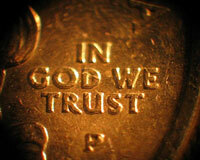 Next time you see a penny on the ground, take a moment to pick it up and start your own conversation with God. And remember: God is very patient and pennies are plentiful!